Hang Out With the Stars at the Emmy's!!! Have you ever wanted to hang with the stars and celebs at a big Emmy party?? Bet you thought that was just one of your dreams, but ET wants to make it a reality!! 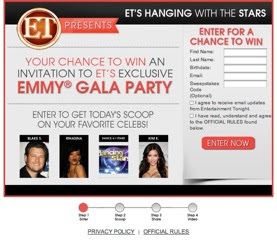 Right now they are running an awesome contest for a chance to win an invitation to ET's EXCLUSIVE Emmy Gala Party! The winner will receive a trip for the winner and a guest to LA, accommodations, red-carpet event at the EMMY's and hanging with the celebs!!! Hurry over and enter today here because this contest ends May 24, 2012 at 4:59PM PDT and you may never get this chance again to fulfill your dreams of hanging with the stars! Once YOU enter the contest, the more YOU share with EVERYONE YOU KNOW, the higher YOUR chances of winning are! !